In this first post, I cover repair techniques to allow water to drain from your porch railings. In part two, I cover epoxy coatings, reassembly, paint, and some additional notes. The link to Part II is also at the bottom of this post. Porch railing repair can get expensive fast. Add that cost to the other job that is likely, porch painting, and it may become downright prohibitive! 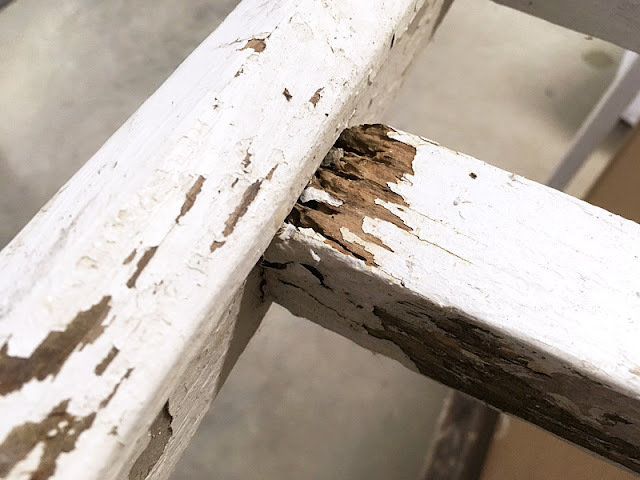 Fortunately, with a few simple products, you can fix your rotten spindles, and even those expensive cedar top rails, without too much skill or effort. Older porches are often made out of western red cedar -a naturally warp and rot resistant (never rot proof) wood grown in North America. 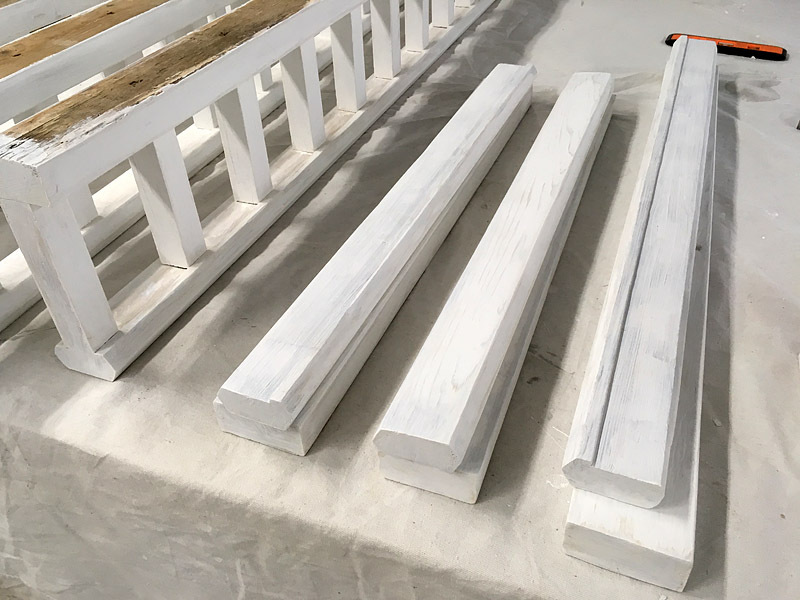 This is a good choice of material, yet many porch railings are constructed by quick moving builders who do not take the extra time to make the little adjustments that will allow rain, snow melt, and dew to drain properly. Water standing for any period of time on paint and wood will lead to the eventual decomposition of both materials. The railing repaired in this post is about twenty years old, just about the amount of time I would expect above ground, western red cedar to last when not draining properly. This house has been undergoing many exterior repairs, including new doors, sill rot repairs, window rot repairs, replacement decking, new stairways, and a new paint job. Some of these repairs were necessitated by the simple non-adherence to good sense carpentry, some are from manufacturer defects (windows), and others simple time and weather. Below I will go over techniques for repairing the top accent rail seen on this house. These same techniques can be used to address rotted top rails and even windows! The lower portion of a porch railing is where much of the decay can be found. Wood placed against wood will hold moisture and eventually decay, even when painted. 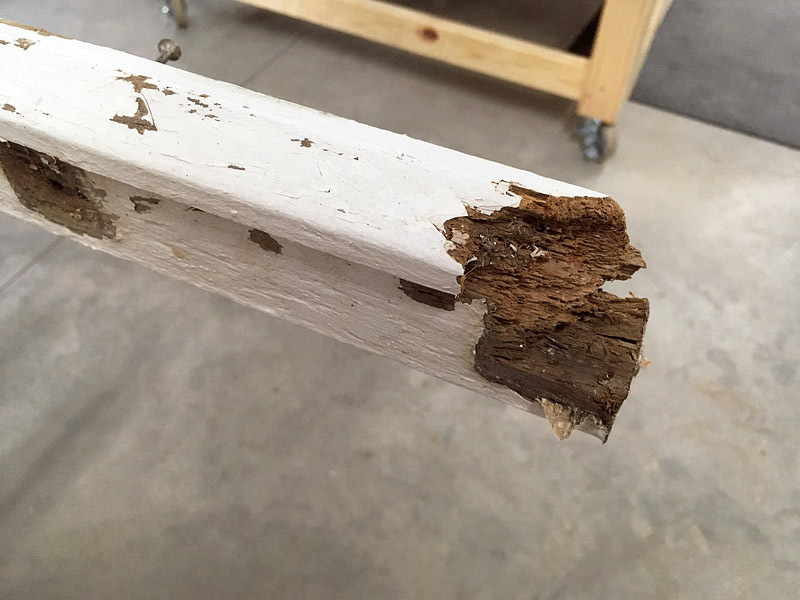 In fact, the rotting wood will undermine the surface coating leading you to notice the rot. Rotted wood is soft, sometimes crumbly, sometimes green with algae, and sometimes even releases moisture when pressed. This is quite likely to happen where the spindles meet the bottom rail, particularly at porch corners where they receive rain from two sides. A spindle's end grain will wick moisture up into the wood. 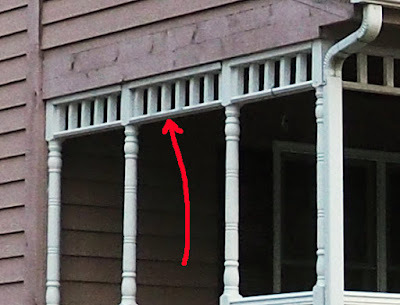 Another prime spot for decay is the bottom rail, particularly at the porch corners. Water running down the porch corner posts and spindles attached to it collects at the bottom rail. The rail's end grain wicks moisture into the rail and the spindle also wicks moisture up into itself, holding it against the bottom rail. This double whammy of moisture will rot the bottom rail from the side and the top! 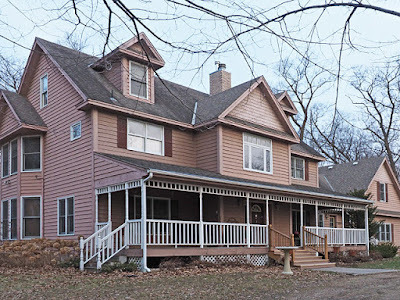 Accents at the top front of a porch tend to not rot -they don't see much rain, but side accents see sun and rain on the south side and on the north side, may never dry out for lack of sun. These two sets of conditions lead to rot! Although many are familiar with shady, damp north side of a house, some people are surprised to hear that a full day of sun can lead to decay as well. For this tutorial I will show you how to fix the porch railing using the accent rails as an example. The process for fixing the lower railing is exactly the same, only with longer spindles. The first step, of course, is to take your accent rails down. They are typically installed with phillips head screws above and possibly finish nails or phillips screws into the porch posts. These should be fairly easy to remove. If nails are used, or screws spin but do not come out, you can use a pry bar -but this may do some damage. Its better to use a tool like the one shown below. The Feintool Multimaster is my home repair go to powertool. If you do any home repair, this tool is a must have. There are lower cost brands, of course, but I trust the Feintool. You can use the metal-cutting blade shown below to slice through soft nails and even hard screws. Be aware that the hard screws will wear your blades much faster than nails. 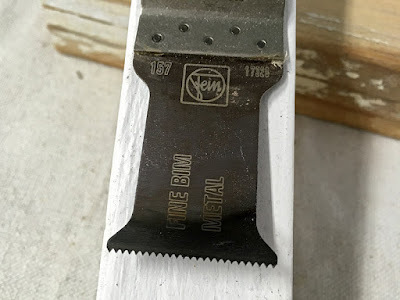 BiMetal Blade. You can use it on wood, but it is designed for metal cutting. The only drawback to a Feintool Multimaster, or any oscillating tool, is the cost of blades. Buy them in bulk to save a few dollars, protect them in your kit, and use them wisely to save on wear and tear. Once you have the railings down you can take them apart. If they are really rotten, it will be easy to separate the spindles from the bottom rail -typically attached with 16-18 gauge brad nails applied with a pneumatic nail gun. These nails are soft and flexible. To protect the bottom rail, you can use the oscillating cutter to slice through these brads. The top board, typically a 2x4, is usually connected to the spindles with phillips head screws. These should be easily removed with a cordless drill and phillips bit. I do not expect the top board to need to be replaced. The bottom rail, a more expensive milled piece of cedar should be saved if it is not too far gone. I'll show you how to fix it, below. 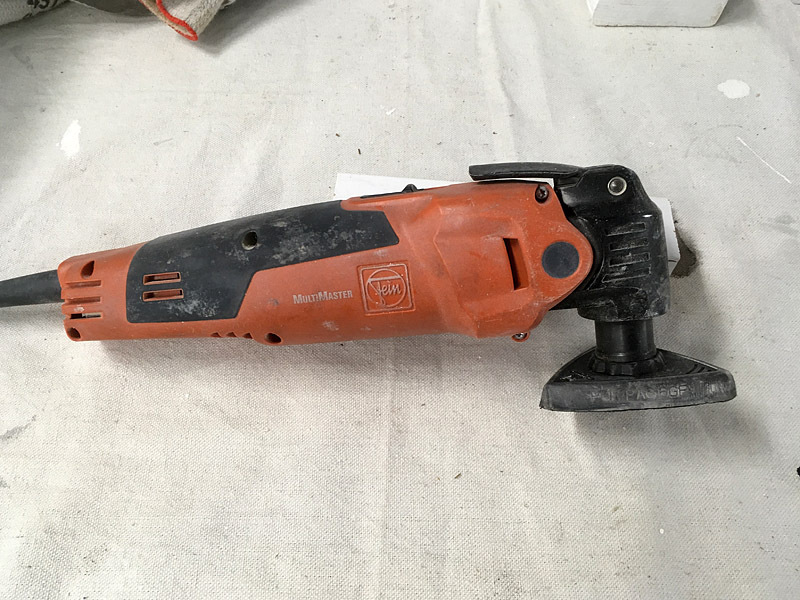 Feintool Multimaster oscillating tool with sanding pad attachment. 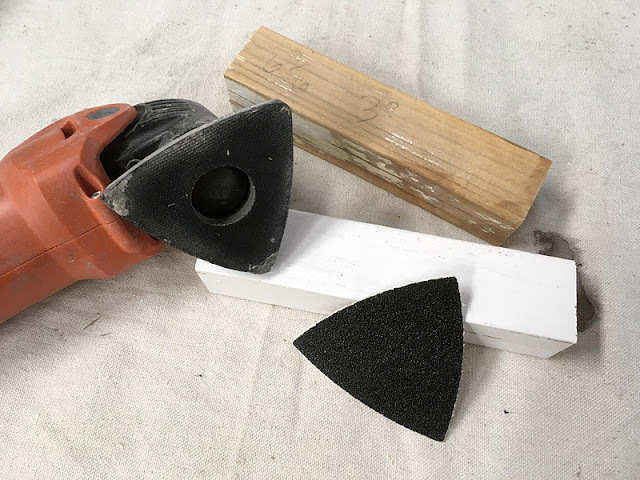 I go to my Feintool Multimaster and sanding pad attachment to quickly remove loose paint on any railing pieces I plan to re-use. The sanding pads come in boxes of 50 in all grits. I use 60, 80, or 120 grit to remove paint on these pieces. These Velcro attached pads are relatively long lived, but their most valuable feature is the ability to rotate the pad to help with difficult corners. I aim to replace all of the spindles, rotten or not. Why? Because the spindle is the lowest cost piece of the railing and, at only 6.5 inches or so, they allow me to get several spindles out of one piece of 2x2 western red cedar. 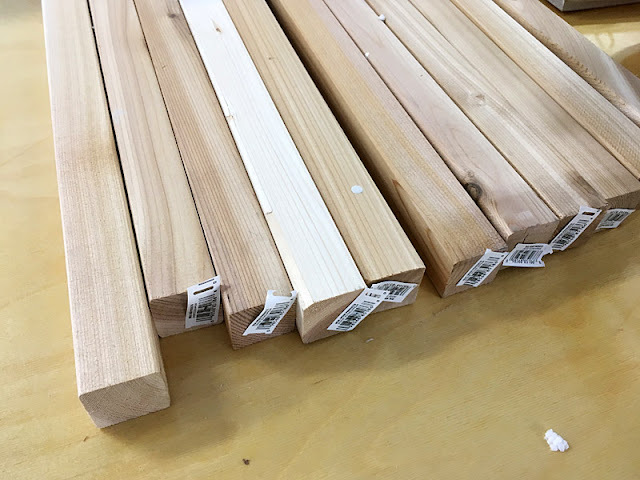 You can buy 8 foot lengths of 2x2 cedar at your local box store or lumber yard, but it may be even easier to find pre-cut western red cedar spindles of 36-42 inches in length. Lastly, the part of the repair that ensures a longer life railing requires another 1/4 of an inch in length. So, if your spindles are in good shape, and you do not mind shortening them, you can re-use as needed. Otherwise, I recommend purchasing a few new lengths of 2x2 western red cedar. A word about choice of wood: you may be tempted to buy treated lumber for any or all aspects of your repair project. I firmly reject treated wood, typically pine, for porch railings. Why? It simply is not stable enough. Where I was asked to use it, it has twisted, pulled screws or nails, split, and has molded on the surface where not painted. Painting it is also a problem, often requiring an adequate drying time before a coating can be applied. In that time, the drying process has twisted or warped the wood. It's simply not good for this forward facing part of your home! A simple, useful tool -the miter saw. You will not need a fancy one for this job. You will need a miter saw for this repair. For spindle cutting, it does not need to be the costliest machine available. What I am using here is a 10" Dewalt compound miter saw, generally a solid cutting tool. You may also use the smaller 7.25-8.5 inch bladed models. 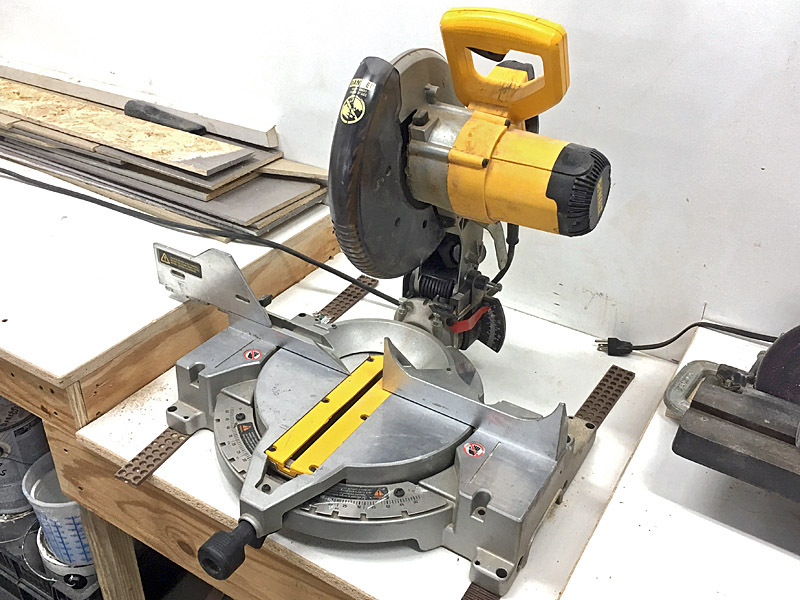 This part of the repair can even be done with a hand-powered miter saw! After all, western red cedar is fairly soft and easy to cut. Your blade should be sharp and, if you cut slowly, a 40 tooth blade will work just fine. The first task is to cut your spindles a wee bit longer than needed. If 6.5 inches is required, then cut each to 6.75 inches. This leaves room for your miter cut. This is important because it is this miter cut that will spare you the rot returning as quickly as it had the first time! 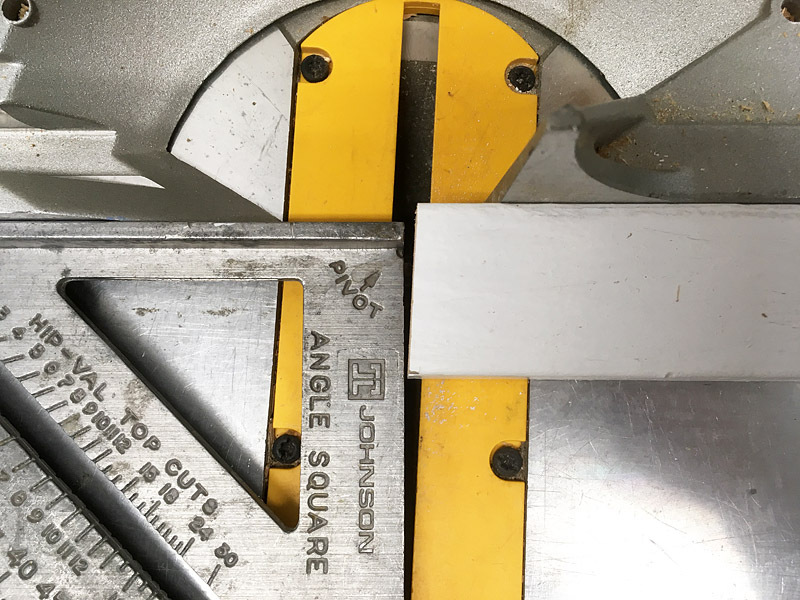 Make sure that your stop, a device that allows all cuts to be the same length, is square! Now that you cut all your needed spindles to 6.75 inches it is time to make your final cuts. To ensure that all cuts are exactly the same length, we clamp what is called a stop to the back fence of the miter saw. This can be done on any type of power or hand miter saw. 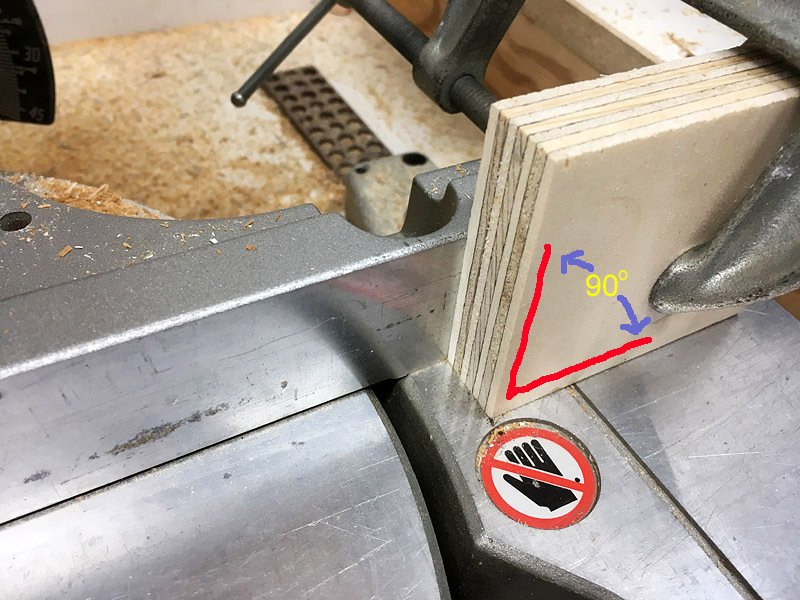 I've used a piece of 3/4 inch thick plywood that I checked for square (see picture above) and ensured that it is mounted flat to the miter saw fence and table. Measuring accurately is important. -the blade tooth lands squarely on the 6.5 inch line. 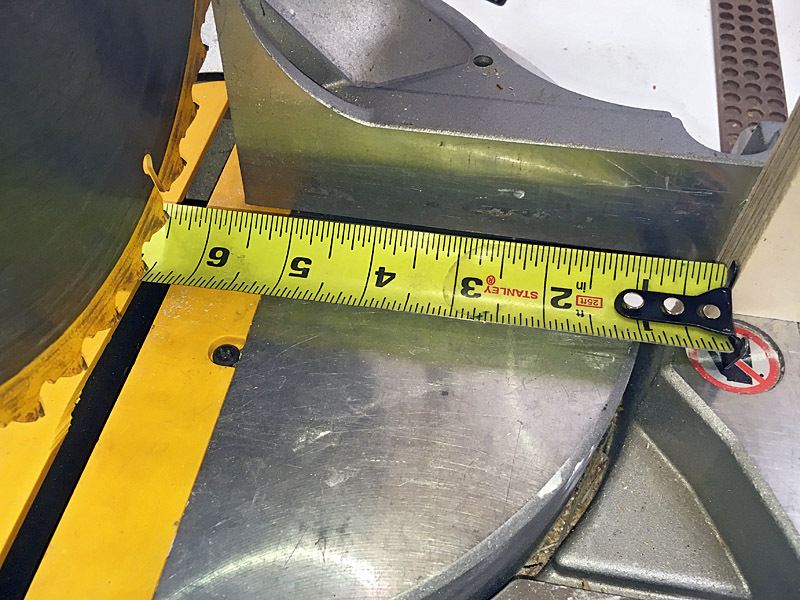 Measure to ensure 6.5 inches from the stop to the right of the saw blade (or left, if you are working from the other side). After measuring, affix the stop with a C-clamp to hold the stop firmly in place -then measure again to make sure it didn't move. 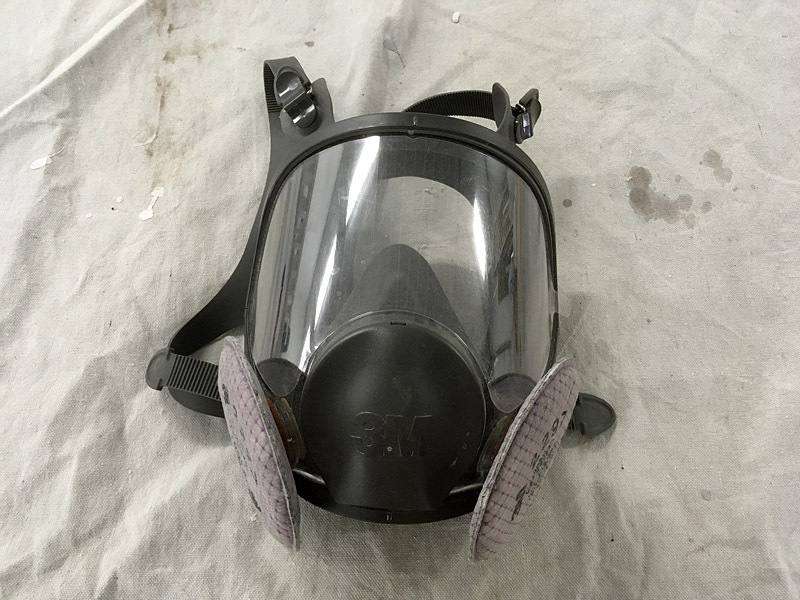 A combination dust mask and face shield. Before making your cut, be safe. Wear safety glasses and a dust mask, or what I prefer -a full face shield with lung protection. It offers better dust protection and full face projectile protection. The above is a 3M model with exchangeable filters for a variety of pollutants and a silicone seal that is remarkably comfortable given its level of protection. Honestly, I wish I bought one of these 20 years ago. Protect yourself! Note the subtle angle, about 4 degrees from square. This little bit of work will spare your railings! Now you are ready to move the miter position about 4 degrees away from the spindle (to the left in this example) and lock it in place (usually by turning the knob). Place a precut, 6.75 inch spindle between the stop and the blade, holding it firmly with hand closer to the stop than the blade. Get the blade up to speed and pass it slowly through the cedar spindle. Hold the saw down while it slows to a stop. This will protect the wood from tear outs and splinters while protecting you. When you raise the saw blade you will see a slight angle on your spindle. This angle gives the spindle a length of 6.5 inches on one side and about 6.625 inches on the other. This little bit changes everything. An eighth of an inch over the spindles' 1.5 inch width is the same slope as a 1 inch drop over 12 inch length. It is the reason the bottom rail will now drain water instead of hold it!